Courtesy of the January 2006 edition of EMCOMM Monthly. Mitigation is the process of lessening the effects of disaster on infrastructure and facilities through design and construction practices. Commonplace examples might include flood control projects, the retrofitting of existing buildings to raise them above maximum flood stage, the installation of hurricane straps on roof trusses and so forth. When conducted properly, mitigation steps provide the greatest return on investment because they prevent or limit damage from potential hazards. Common examples of preparedness steps include the stockpiling of supplies, the training of emergency responders, the acquisition and testing of specialized apparatus and monitoring equipment, and so forth. Training in the area of disaster communications procedures, drills, and exercises conducted by an ARES or RACES group are typical examples of preparedness functions. Response involves the actions taken by first responders and relief agencies to respond to an imminent or occurring disaster situation. In other words, troops and resources are deployed to the field and rescue and relief actions occur. 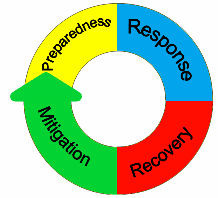 The success or failure of the response phase is largely predicated on the effectiveness of the actions taken during the preceding preparedness phase of the cycle. This phase may also be called “the rebuilding” phase. Critical infrastructure services are restored, buildings are restored, debris is removed and so forth. Ideally, as each facility is rebuilt, failure modes are identified and steps are taken to prevent similar failures in the future. As such, one might say that in the ideal emergency management program, recovery blends into mitigation and the entire cycle begins again. Is the tower supporting the repeater antenna at capacity or overloaded? Can it withstand high winds and significant radial ice accumulation or seismic activity? Is the installation designed with proper grounding and bonding methods? Is the coaxial cable shield bonded to the tower at several points along its length? Are polyphasers installed on the coaxial lines and AC Mains? Are the RF, telephone, and AC Mains grounds bonded together with a proper low impedance conductor to limit differences in potential and resulting dielectric breakdown and current flow within interconnected equipment? Are standby power systems in place? Consider a packet radio network. Many such networks rely on volunteer facilities located at the homes of individuals. How do we know if these facilities are properly engineered and hardened? Do key nodes have emergency power? Will the same tower that supports the oversized 40-meter “monobander” and the packet Digipeater antenna survive a major windstorm? What happens if the Amateur operating the BBS or node decides he doesn’t like the EC or Club President and hits the off-switch? What happens if the operator of an important node leaves for vacation and turns everything off a few days before the tornado hits? Identify and prioritize your most basic and essential facilities, such as key ARES® FM repeaters and packet systems. Invest your initial effort insuring they will remain operational in time of emergency. Favor locating key facilities at locations other than an individual’s home. When packet nodes, BBS systems, APRS nodes or repeaters are located on a government or commercial tower, they tend to be more stable, longer-lived, and accessible at any time regardless of any one individual’s work or vacation schedule. Institute mitigation steps in the form of proper grounding, bonding, surge suppression, and emergency power. If finances permit, do not rely on portable generators or systems, which require drawing gasoline from service stations. In time of emergency, gas stations may experience long lines or be inoperative due to widespread power outages. Remember that mitigation extends to the individual. Can you operate on desired nets from home for several days without power? Do you stock alkaline batteries for use in your hand-held radios when power is unavailable to recharge ni-cad packs? If you participate in HF radio, are you capable of utilizing power-efficient modes such as CW, PACTOR, etc? Hams often like to “beat their chest” after an emergency. Isolated successes are celebrated, but, unfortunately, many failures are overlooked. What are these failures? The inability to communicate effectively is rampant in Amateur Radio. Far too many radio amateurs can’t even use the standard ITU phonetic alphabet to spell an unusual chemical name or similar data, let alone format a message for transmission on behalf of a third party. Most radio amateurs cannot assume the duties of NCS and maintain net discipline and a neat radio log for administration and reference. Valuable circuit capacity is wasted in the first days of an emergency while inexperienced operators “think aloud,” utilize unnecessary language, and require messages to be repeated again and again because they are not used to writing things down accurately. When repeaters fail, few radio amateurs can identify and use alternative modes and methods, whether they be VHF simplex or HF radio. Sadly, some will suggest that the fact that we are volunteers is an excuse for a failure to develop basic skills. Yet, if the volunteer fire department were to show up at the same person’s door, he or she would have a reasonable expectation that they would arrive properly trained. So why is it that so many radio amateurs feel that mere possession of a radio qualifies them to be emergency communicators? Can we expect government and relief agencies to rely on our services if we fail to train or learn to perform our primary role of communications effectively? An understanding of basic net procedures and the use of the standard prowords needed to maximize net efficiency and maintain circuit discipline. The ability to apply the standard ITU phonetic alphabet to spell difficult words and names, such as chemical names and the like. The ability to format and efficiently transmit a basic NTS format message on behalf of a served agency. An understanding of one’s basic roles and responsibilities and how to interface with the customer (served agency). The ability to deploy with proper personal protective equipment, basic two-meter or other portable radio equipment, and so forth. Access to basic equipment, which allows one the ability to operate from an agency vehicle using “mag-mount” antenna and cigarette lighter plug, or deploy to areas inside large buildings, and operate for a couple of days without AC mains. The good news is most radio amateurs need only develop a basic set of skills to support the majority of emergency communications activities. Specialized communications capabilities, such as digital or CW capabilities can be dealt with through a more specific management approach through which individual operators are recruited to specialize in a particular emergency communications area. When potential failure points are identified, implement a plan to correct them. Concentrate on oft-used key systems first, such as local two-meter repeaters. Insure that survivable communications systems are in place (HF Radio, VHF simplex). Identify the baseline of training necessary for effective response. Insure that rank-and-file ARES® members are trained in these basic skills. Identify specialized skills and capabilities needed for effective response. Recruit individuals to develop these skills and capabilities. Insure that specialized capabilities are staffed three-deep to allow for extended operation in shifts as well as the loss of individuals to the impact of disaster. "Reproduced courtesy of EMCOMM MONTHLY. Read EM on line at: www.emcomm.org/em/."